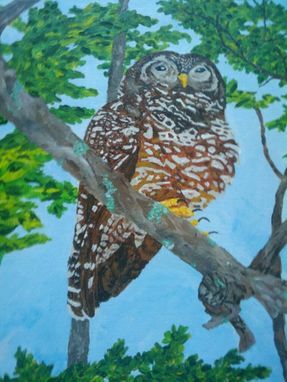 Painting: "Guardian Of The Lost Forest: Spotted Owl"
Two summers ago, one of my favorite places in Arizona burned to the ground; Miller Canyon, in the Huachuca Mountains. 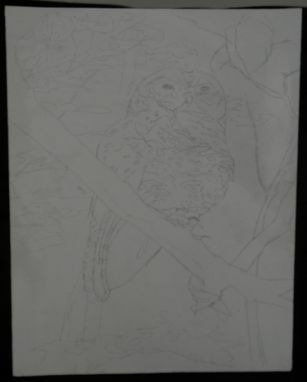 There was a pair of Spotted owls that regularly could be found next to a stream, just by a split rhyolite boulder. My experiences with them also lead me to conclude that if I was in Hogwarts, as a Slytherin, this would be my owl. This is one of them. I painted it in memoriam, I guess. It was also the first owl I ever painted. I have to say I am pleased with how it turned out. This piece was on canvas board, and was 16"x24"